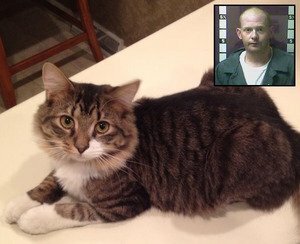 According to the Richmond Register, a man accused of allegedly breaking a kitten’s two front legs with a golf club has been charged with second-degree animal cruelty — a class A misdemeanor that imposes a fine of no more than $500 and a sentence of 90 days to 12 months in jail. Prosecutors originally sought a class D felony of first-degree animal cruelty charge against Gary L. Foster, Jr. but failed to get a grand jury indictment. It would have meant a sentence of one to five years in prison. The injured kitten was Lucky, who CatTime reported on in August of last year. The incident took place in Kentucky. Lucky’s shattered limbs have healed since the assault, thanks to generous donations and the dedicated staff at Barnes Mill Animal Hospital. You can follow Lucky’s progress on the “Lucky” The Broken Kitten Facebook page.